Data for Brulle’s latest work comes from the 1995 Lobbying and Disclosure Act that requires all lobbying efforts that take up more than 20 percent of the time be reported. Nearly 2 million records were evaluated from 1986 to 2016. Key words utilized in this study were: climate change, global warming, greenhouse, Keystone, renewable energy, carbon, clean energy, Kyoto, cap and trade, CAFE, fuel economy, and renewable electricity. 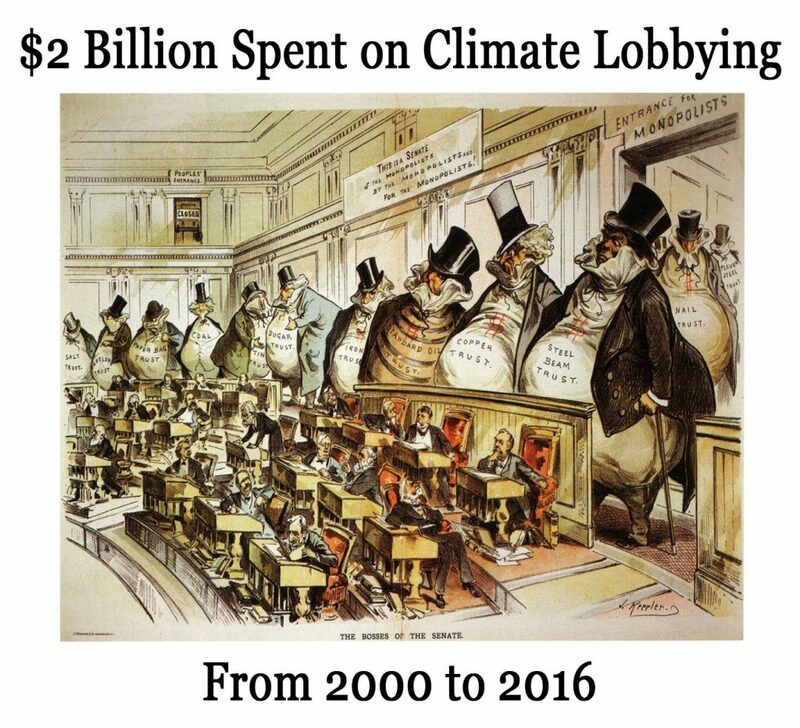 About $2.08 billion (in 2016 dollars) was spent on climate lobbying between 2000 and 2016. This is about 3.9 percent of total lobbying dollars spent of $53.5 billion. The electrical sector spent 26 percent of the total. The fossil fuel sector spent 17.7 percent, and the transportation sector 12.1 percent. The research also identified 231 different organizational types that do not fir into standard categories. Brulle says that the “spending of environmental groups and the renewable energy sector is dwarfed by the spending of the electrical utilities, fossil fuel, and transportation sectors.” Lobbying expenditures from 2000 to 2016 for environmental and renewable energy groups amounted to only five to seven percent of the total, or less than $145 million. Interestingly, Brulle shows lobbying for and against climate legislation in this period was about evenly split, indicating that anti-climate change players were once again playing both sides of the discussion in an attempt to promote a false, or at least an unseeming support of climate legislation. Abstract: Brulle, The climate lobby: a sectoral analysis of lobbying spending on climate change in the USA, 2000 to 2016, Climatic Change, July 19, 2018. Brulle,Institutionalizing delay, foundation funding and the creation of U.S. climate change counter-movement, Climatic Change, December 2013.